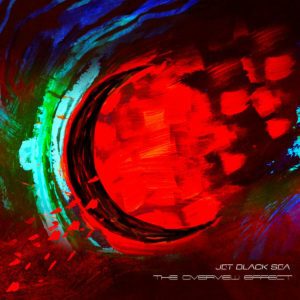 The work of producer/multi-instrumentalist Michel Simons and multi-instrumentalist Adrian Jones, Jet Black Sea was originally conceived as a side project to Jones’s prog rock band Nine Stones Close. A vehicle for experimentation, their debut release ‘The Path of Least Existence’ mixed elements of prog rock, ambient music, electronica and post rock with fantastic results. A follow-up ‘Absorption Lines’ was almost five years in the making. Absorbing more mellow prog rock sounds than before – presumably since Nine Stones Close had, by that time, veered towards a more prog metal sound on their 2016 LP ‘Leaves’ – the album was well received among online prog fans. Even before the release of ‘Absorption Lines’, Jones and Simons had stockpiled ideas for a third record. As a result of their being extremely busy, 2018’s ‘The Overview Effect’ came together in double quick time, with Jones quickly asserting that the album could be the very best thing he’s been involved with to date. A concept album, its three pieces of music expand on the space themes of ‘Absorption Lines’ and this time out concern a take off, a journey and a landing of a craft. The main thing you need to know is that ‘The Overview Effect’ is that takes a long time to digest. More concerned with moods than easily swallowed melodies, its three tracks stretch out to forty five minutes…and thirty five of those are taken up by the title track alone. While, on the surface, it seems that ‘The Overview Effect’ (the track itself) could’ve been broken down into different pieces of music, the way it flows naturally leans towards it being heard as one long number – there’s more coherence here than during most of Yes’ legendary 1973 cut ‘n’ paste cure for insomnia ‘Tales From Topographic Oceans’, or your average Flower Kings record. To start, Jones and Simons lay down a whole world of keyboard drones and swirls, very much giving a feeling of detachment. The elongated chord definitely has a root influence from Pink Floyd’s classic ‘Shine On You Crazy Diamond’, whilst the overlaid electronic effects draw parallels with early 90s pieces by The Orb. Introducing a drum loop at around the three minute mark very much allows the drones and tones to weave in and out, always keeping interest. If you love twenty first century Tangerine Dream – circa ‘Quantum Gate’ – you’ll be in heaven. For those who came looking for something more within a prog rock framework, the electronica soon subsides for mellow rock…and Nine Stones Close vocalist Adrian O’Shaughnessy steps in for a surprisingly melodic vocal, showing an ability to croon like Geoff Tate during ‘Silent Lucidity’; it’s a performance that’s both unexpected – prior to this JBS were always instrumental – and quite removed from his metallic traits with his other band. Increasing the programmed beats and boosting everything with live drums, the end of the first part of this epic finds a perfect balance between ambient electronica and prog rock. Jones throws out jagged guitar sounds that really call to mind bits and pieces from the IQ and Floyd catalogues and before you know where you are, a number that at first seemed to have an impenetrable length is already one third of the way through. Moving deeper into electronica, the ten minute mark changes the mood as JBS draws everything in to an uneasy repetitive keyboard loop that, once heard, it’s impossible not to think of Tangerine Dream’s ‘Thru Metamorphic Rocks’. Whist possibly too electronic for some of the prog crowd, its general feel seems almost timeless. Joining the relentless loop, slow beats and extra drones form a melody and – along with a deep bass – it’s one that completely evokes images of open space and floating, and especially so once Jones steps forward with a fantastic sounding guitar solo. Then, continuing with the heavy beats, a synthesised guitar sound creates a repetitive melody, under which a huge bass offers one of the best elements within the sprawling half hour musical canvas. Eventually another vocal passage moves the narrative forward, but it seems as if the voice is surplus to the music which, by now, has morphed into really fantastic prog, with the perfect balance between floating guitars and heady rhythms. As more heavy bass grooves underpin a blanket of keys, the sounds are ore akin to Porcupine Tree than Floyd, really showing how JBS’s complex sound takes in all kinds of prog from across the decades. The production and mix at this point is stunning – every bit as good as a major label band with decades of album sales to their credit. Via several minutes’ worth of clanking – somewhere between the scariness of Tangerine Dream’s ‘Atem’ and a Pink Floyd soundtrack from 1969 – the serenity of acoustic guitars eventually cut through for some light prog/space rock vibes, and the marriage of Jones’s stringed instruments, Simons’ blankets of electronic sound and sampled voices hark back to the previous album, making each JBS album feel even more like a new step upon the same journey. Finally, more beats indicate the return of a melody and to finish, the band delve into some melodic rock with a proggy edge that brings out the best in the talents of all involved. In some ways, the more song-oriented section feels a little like it’s been bolted on, but it still provides five minutes of very enjoyable music, somewhere between ‘Fear of a Blank Planet’ Porcupine Tree, light prog metal and a mellow Nine Stones Close workout. By the time a last guitar solo emerges, the sharp mix allows the melodies to really shine in a way that would deserve a 5.1 mix on blu ray. Half hour tracks have rarely felt as complete as this – The Flower Kings could learn a thing or six. Bookending each end of the album, the two shorter pieces – the take off and landing – shouldn’t be overshadowed by the journey itself. Despite what some prog fans think, there’s actually more merit in concise composition and ‘Escape Velocity’, in particular, is an excellent case in point. Taking cues from ‘Metallic Spheres’, The Orb’s album with David Gilmour’, an intro weaves magic with ambient string sounds and keyboards, eventually blossoming an electronic loop and soaring guitar lines, accentuating Jones’s gift for fluid playing. A burst of this is eventually interrupted by something heavier and more metallic, bringing Jet Black Sea closer to Nine Stones Close, and while the more ambient side of things would perhaps would be preferable, the resultant repetitive riff has a real presence. Bringing O’Shaugnessy in belatedly on vocals, the sound is complete…but the whole picture is quickly outshone by Jones teasing with a very brief solo. Too brief. The landing piece, ‘Home (E.D.L. )’ is soft and wistful at the outset, displaying a longing for home turf. A strident but melodic piano riff provides the heart of the melody, over which a Floydian drum part and twenty first century prog tones are able to build. O’Shaughnessy puts in the best vocal performance of his career to date; pulling back from his favoured louder styles once more, it’s when showing an ability for something soulful, almost in a Geoff Tate-esque mood, his talent really becomes clear, before Jones delivers a final solo of Floydian goodness. Regardless of how many layers are constructed, though – warming bass, soaring strings, melancholic rhythms – it really is all about that piano. Such beauty from sheer simplicity…and you’ll be glad that it provides one of this albums final melodies, leaving you in a contemplative mood when the journey is over. ‘The Overview Effect’ isn’t always as easy to get into as previous Jet Black Sea works. It isn’t an album you can dip in and out of lightly, but at the same time it doesn’t outstay its welcome. You might be able to find better pieces of music on their previous albums, but as a whole work, this is far more confident and Jones’s playing – especially – is a good step above his older recordings with Nine Stones Close. Whilst not necessarily an every day listen, this album definitely shows a band who’ve really worked the studio to their advantage more than ever, resulting in a fine slice of prog that deserves to break Jet Black Sea to a wider audience. Read a review of Jet Black Sea’s ‘Absorption Lines’ here. Read a review of ‘Leaves’ by Nine Stones Close here. This entry was posted in Album & EP Reviews and tagged adrian jones, ambient, electronica, jet black sea, prog, rock by Real Gone. Bookmark the permalink. A good read, and one I tend to agree with for the most part. I love the music on this release, even the more ‘kitchen sink’ moments. My issue, however, is with the vocals… I’m glad you used the word “superfluous”. I also think that, when they appear, they tend to either be overly drenched with effects or harshly dry/cold 🤔 It’s a shame as it’s really tinged my listening experience.